Major purchases tip the scales against your favor. Avoid making any major purchases. You might be thinking about purchasing new appliances for the new home. This is not the time to do it. Avoid making any major purchases on jewelry, appliances, furniture, vacations, or anything with a significant price tag. Buying or leasing a car can make a negative impact on the way the lender views your financial status. This is a big ticket item that dramatically affects your debt to income ratio. You may feel you have room in your budget to purchase a new car, and think this is a worthy investment if you are looking for a home that will mean a longer commute for you on a daily basis. 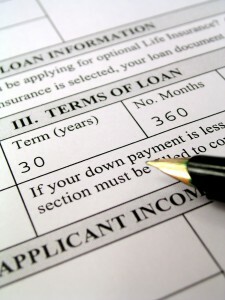 But by tacking a car payment onto your existing debt, you reduce the amount that you will qualify for in a home loan. A $400 a month car payment can reduce your approved loan limit by as much as $50,000. Think about doing this after your loan is approved if you really need it. If you have to change jobs, you may be asked to document why this change occurred. If you are changing jobs to increase your income, that’s a no brainer for the lender. If you have an erratic work history to start with, another job change may make it look worse for you. If you are an hourly wage employee, most likely a job change will have no effect on your ability to qualify for a loan. If you have a track record of a consistent amount of overtime or consistent bonuses over the last two years, the lender views this favorably. If you change jobs, there is no way of knowing if the new employer will pay overtime. Many do not! If you work on a salary + commission or straight commission basis, it has a dramatic effect on your stability. If you are considering starting your own business, again, this is something to consider after your loan is funded. Call a mortgage professional before you make a switch to make sure it won’t negatively impact your ability to qualify. Getting knowledgeable advice in this area is critical. Don’t try to tackle this on your own. There is a “rule book” on what makes up a credit score and unless you know the rules to the game, you should never attempt anything before a consultation. Oftentimes, what you think makes logical sense and will help, actually hurts your score. For example, paying off an old collection will actually hurt you in the short term. If you are talking to a mortgage consultant, ask them what their specific education is in this area.